• Optional use of hot water as a by-product. In September 1995 a TEPVIS-tank was ordered at a locksmith’s shop in Harare (Zimbabwe). The material used for the construction was galvanized steel  (see Fig. 10.20). Fig. 10.20. 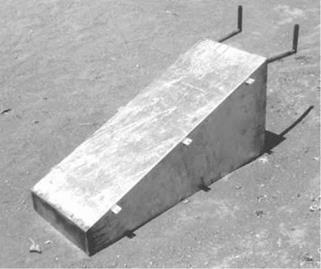 Tank for reduction of cell temperature and serving as module mount/ foundation, manufactured in Harare (Zimbabwe) by galvanized sheet steel (without internal convection aid). Research on an increase of PV-efficiency and electrical power output by means of a reduction in operating cell temperature has been carried out by the author since 1989 in a Ph. D. thesis (see Krauter 1993c). To know more about real operating behavior under tropical climatic conditions, specifically about cell temperatures and the output power (at MPP), a module (M55 from SSI) was tested at the PV Labs of the UFRJ in Rio de Janeiro (22°54’ S; 43°13’ W), Brazil during an equinox (9/22/1994). The components of irradiance (horizontal global, direct and diffuse) during that day have been recorded, as shown in Figure 10.14. Fig. 10.14. Horizontal global, direct, and diffuse irradiance at Equinox (9/22/94) in Rio de Janeiro, Brazil (22°54’S; 43°13’W).